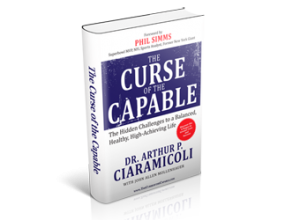 In this book, Dr. Arthur Ciaramicoli makes a well-informed and convincing case that happiness does not inevitably ensue from our personal or professional achievements. The widespread belief that it does is the very foundation of the “curse.” Happiness is not a function of doing but a positive way of being that fosters genuine relationships with self, with others, and with life in general. Excellent read! This is a rare and special book, wise and helpful, savvy and profound and should be a real life saver for millions who are actually prevented by their drive and ability from having lives that are genuinely satisfying. A wonderful road map not just to a good life but to a life that feels good.